I hope you all had a great weekend! We are experiencing warm weather here and we have been living mostly in our garden this weekend. 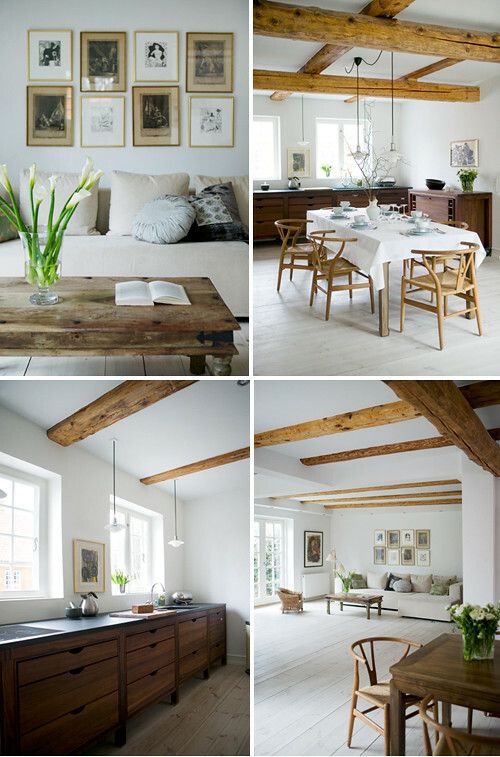 Today’s post is showing a beautiful family home north of Copenhagen, Denmark. This house has lots of gorgeous features such as those beautiful wooden beams. 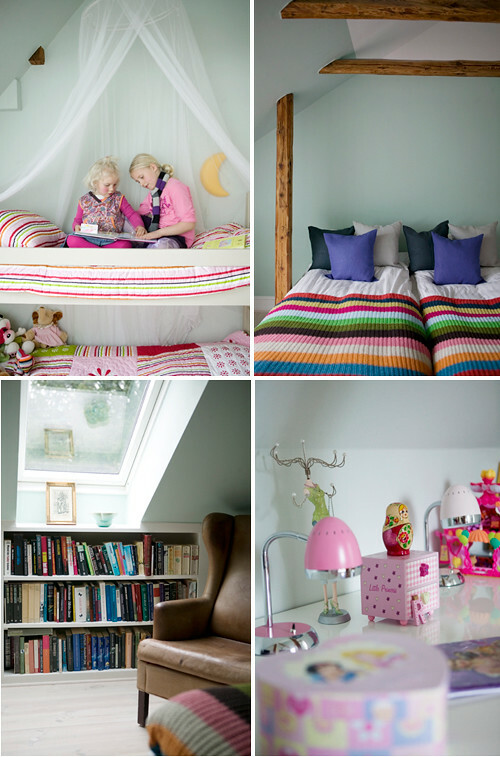 The kids’ rooms are decorated with more color (images above). I am loving the photo wall in the image below (lower left corner). 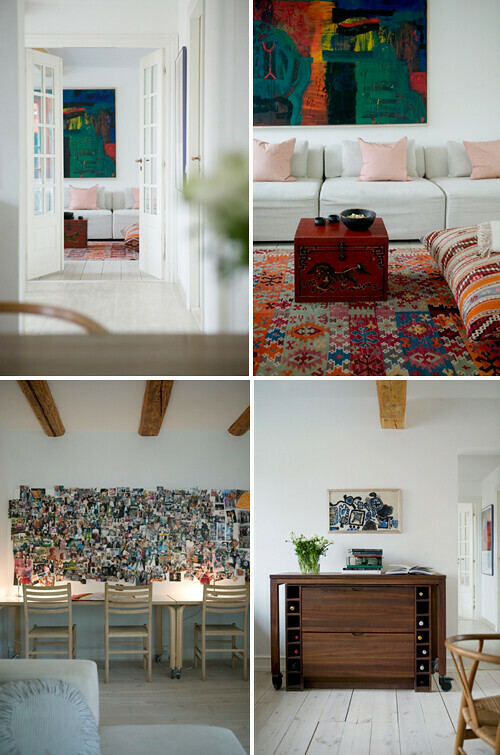 Such beautiful, luminous interiors! Love the fireplace, the white and the splashes of colour. What a great mix of style inflcuences. I really, really love this one. Thank you for sharing it. Oh, I am so happy to see this! We just moved to Denmark and are currently looking for our new home in Copenhagen! I love all the beautiful inspiration you have been sharing lately! I’ve noticed what seems to be a custom in many European countries of putting two duvets on a bed larger than a single size and folding them in half as seen in one of the pics above. Are you familiar with it? We don’t do this in the US and I’m wondering why they do it. I’d love to hear more about it if you’re familiar with the custom. Love the accent of the furniture so adoring. LOVE IT! absolutely everything…dream home. Your question about the duvets. The duvets in the picture above are not large duvets, but single size duvets with only the very edges folded in. It’s merely an aesthetic thing. Here in Scandinavia most of us sleep in queen- or king size beds with each our single size duvet (though some couples share one big duvet). I Love this cabinetry (raised legs, cut-out pulls)! As a new home owner trying desperately to find a kitchen that I love, Where could I find these cabinets in Canada or where can I order them from online? 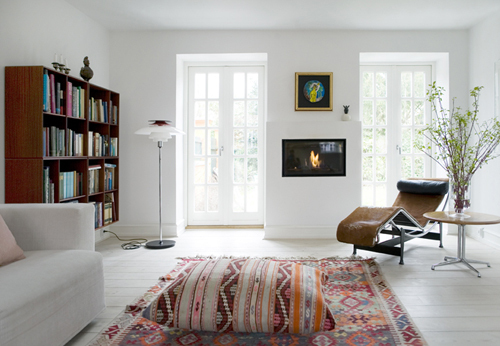 Scandinavian Style is so beautiful.